Community volunteers working through the Strategic Doing process in Jewell County planned and implemented the Kansas Mammoth Music and Arts Festival. By all standards the festival was a huge success. Approximately 600 people ranging in age from 2 to 92 and coming from not only Kansas but Colorado, Arkansas, Missouri, Iowa and Oklahoma attended the 2-day event. At the park they enjoyed interactive art activities for all ages, art vendors, yoga, circus performances, food vendors, and live music in many genres. The festival also featured activities downtown including breakfast on the bricks, a free kid’s movie, museum tours, art classes and street performances. 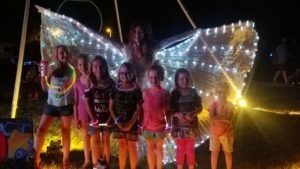 A grant from the Hansen Foundation along with multiple individuals, businesses and groups in Jewell County volunteered to make the festival happen. Local youth organizations and the fire department raised funds through food booths and the beer garden, respectively. The Mammoth theme was determined as many Colombian Mammoth bones had been found in Jewell Co in recent years. The planning group decided to make it a theme for the festival and for Jewell County in general. Stay tuned!